Our Energy Binge Is Over! Amazingly enough, there are still people who continue to maintain that the energy crisis is merely a contrivance of the big oil companies to drive up the price of gasoline. Such persons refuse to believe that this nation, and in fact the whole world, is confronted with an emergency situation with regard to dwindling nonrenewable energy supplies. They refuse to believe this world is finite; that there are no new petroleum and natural gas deposits being built up within the earth today. They like to believe we have thousands of years of energy reserves left, instead of, in fact, comparatively few. The view of these people notwithstanding, the energy crisis is real. The Western world has been on a three-decades-long energy binge, and a massive hangover is just about to strike! Over half of the energy that Americans and other Westerners consume so liberally comes from a single source — oil. Since the end of World War II, the consumption of oil by the Western world has risen with reckless abandon. As far as energy was concerned, we thought there was no tomorrow. The hard reality of the energy situation didn't really dawn on most Americans until they were forced to begin waiting in endless lines for their gasoline following the Arab oil embargo of November 1973. That embargo marked a turning point in the course of modern history, signaling an end to the days of cheap and plentiful energy that Western society had so blissfully enjoyed for three decades. Whether we admit it to ourselves or not, our energy joyride is over. In the future, says former U.S. Commerce Secretary Peter C. Peterson, the days of cheap and easy energy "will be an era on which we will look back with nostalgia, but no amount of wistfulness and sentimentality will bring it back." Many do not realize, moreover, that the energy problem is far more than just one of exploration, of development, of prices. We are facing a crisis in energy because of fundamental shortcomings built into the very fabric of our modern society. We are literally hooked on an energy-guzzling way of life! Just press a button, flip a switch, turn a key, or push a lever, and automatically something is buzzing, humming, or whining away — blenders, juicers, mixers, electric can openers, garbage disposals, electric razors and additional dozens of appliances and conveniences found in most American homes today. And, of course, there is that biggest "toy" of all — our inefficient, gas-guzzling automobile, for which we continue to import increasing billions of gallons of oil. In the past 30 years, the world has consumed more power than was used in all of history before 1940! With only six percent of the world's population, America alone has managed to consume a walloping one-third of the world's annual energy and mineral production. To Americans today, power is not simply a luxury; it is a vital necessity. We could not function without it. We depend upon it not only to run all of our electric conveniences and to fuel our automobiles, but also to grow and distribute our food, heat and cool our homes, and ignite the furnaces of industry. We have literally become slaves to energy. Compounding the problem, most of the major reserves of our primary energy source, oil, lie beneath the sands of the politically volatile Middle East. As wealthy and powerful as the nations of the West are, they lie today at the mercy of a few small, potentially unstable states which most Westerners couldn't even pinpoint on a map. 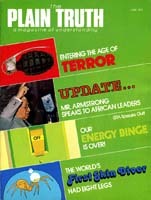 "One does not have to be a prophet of doom," states the International Institute for Environmental Affairs, "to foresee the emergence in the not-too-distant future of politically divisive competition among high energy-consuming nations for access to dwindling fuel supplies... [or] even temptations to resort to the use of force to assure reliable supplies of energy materials... "
And that's precisely the way things are going today. The solution to this multifaceted problem involves a total change from top to bottom in society itself a change we have thus far refused to make. Yet, for over four decades, this magazine has been predicting just such a change. It has been proclaiming a message of hope for the future, a way out of the snarled mass of problems besetting the earth today. To be sure, we are living in a time of global social, economic, political and military chaos, of which the energy crisis is but a part. But there's coming a new, a brighter, a different, and a totally better world than the one we know today — a prosperous, peaceful, restructured World Tomorrow under the government of Jesus Christ. And that's good news! But until then, we may have to" learn some important lessons through hard experience.